If you’re looking for landscaping in East London, you’ve come to the right place. Spenwell General Builders are experts when it comes to landscaping and outdoors works, having worked in this field for many years in Greater London and Essex (especially Romford, Dagenham, Chigwell, Woodford, Ilford, Brentwood, and East London). As we all know, London weather can be quite temperamental, but it’s all worth it for those gorgeous sunny days in the spring and summer that make us all want to chill back and relax beneath the warm, blue sky. It’s days like this that make us all wish we had a lovely garden and outdoors space for long lounges and relaxing get-togethers with friends and family. Depending on your property size and space organisation, there is a lot that can be done with the help of an expert construction company. How about a nice deck that provides a level-surface for chairs and maybe a table, all while letting you take in the view of your garden or surrounding areas? Maybe there’s even room for a little pond to complement a grassy field! There really are many possibilities, whether you’ve thought of them yet or not. If you’re looking for a builder near you to help you turn your outdoors space into the garden of your dreams, we’d be happy to help you out with our experience and practical know-how. 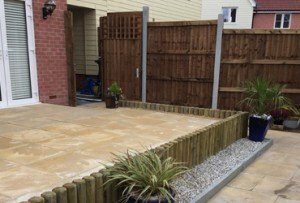 We are experts in a range of services, such as landscaping your garden or backyard, laying patios, decking and ponds, pathways, fencing, driveways and turfing. We serve the Greater London and Essex areas, and will be happy to come to your property to survey it and discuss options with you directly. As part of our service to you, we include a free estimate of the work that needs to be done and how much it’s going to cost. We will try to be as accurate as possible so that you have a realistic picture of the whole process before deciding whether you want to go through with it. All our estimates come with no obligation to take us on as your chosen builders. If you’re looking for reliable landscaping in East London, Essex or Greater London (particularly Romford, Dagenham, Chigwell, Woodford, Ilford, Brentwood, and East London), then call now to talk to us about the ideas you have for renovating your outdoors space. With 25 years in the field and a great passion for serving our customers, we’re a local construction service you can really trust.